The Italian original is titled "Io Che Non Vivo Piu d'Un Ora Senza Te" and was the entry for the San Remo Song Festival in 1965, sung by Pino Donaggio. 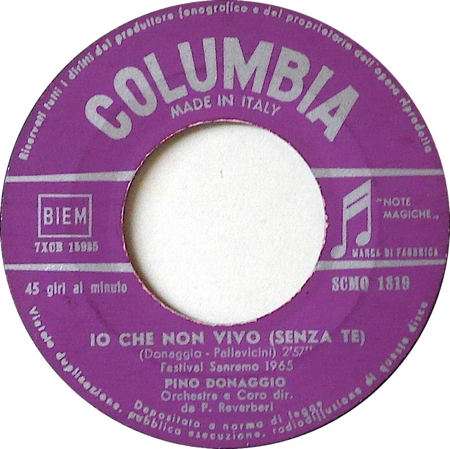 The label showed the title as "Io Che Non Vivo (Senza Te)." Giuseppe "Pino" Donaggio was born in Burano near Venice, Italy, on October 24, 1941. He began studying violin at the age of ten and at the age of 14 made his solo debut in a Vivaldi concert for Italian radio, later playing for both the Solisti Veneti and the Solisti di Milano. Donaggio's classical career ended when he made his singing debut with Paul Anka. He then began to write his own songs and established himself as one of Italy's prominent singer-songwriters. His biggest succes came with this number. Dusty Springfield got Simon Napier-Bell and Vicky Wickham to provide English lyrics and scored a number one in the UK and a number 4 in the US Hot 100 in 1966. Eddy Arnold was born on 15 May, 1918, near Henderson, Tennessee. By the age of sixteen, he was singing on local radio stations and by 1943 had performed as a solo artist on the Grand Ole Opry. Tom Parker (yes, that Tom Parker), became his manager and he signed to RCA Victor in 1944. He enjoyed a remarkable recording career and was also active in television and films. He sacked Parker in 1953. In 1955 Arnold had a storyline for a song and asked songwriter Cindy Walker to write something based on it. That was the genesis of "You Don't Know Me." 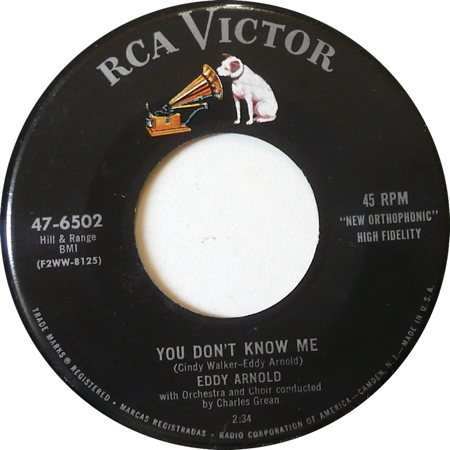 Arnold's original version was recorded on 1 December, 1955, and released as a single on RCA Victor 20-6502 and 47-6502 in April 1956. Eddy Arnold may have made the first recording of this number, but Jerry Vale's was first released. The best known version, however, is probably that of Ray Charles who had a huge hit with it in 1962. Eddy Arnold died on 8 May, 2008. Elvis recorded "You Don't Know Me" twice: firstly the film version (used in "Clambake") and then again on Monday, September 11, 1967, for record release. 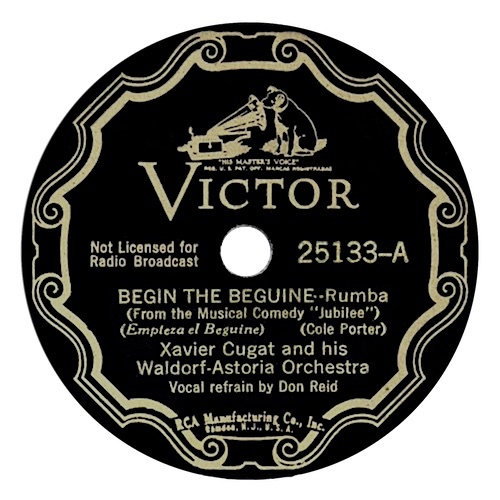 Cole Porter wrote the number "Begin The Beguine" in the early thirties, basing it on a dance from Martinique. It seems that this was his favourite song. Elvis liked the number, too, but there were problems involved with him recording it, so he decided to rewrite it, which he promptly did, with the help of friends Charlie Hodge and Red West. The tune was also changed, but elements of the Cole Porter "original" (heck, even he wasn't original!) 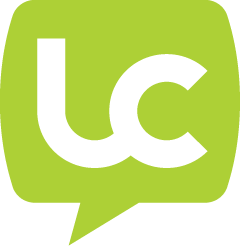 can clearly be heard. "Begin The Beguine" was first performed by June Knight in the stage musical "Jubilee" in 1935. The first commercial recording, however, was made by Xavier Cugat and His Waldorf-Astoria Orchestra, on 5 September, 1935, and released the following month on Victor 25133. The vocalist on the recordinging was Don Reid. Xavier Cugat was born on 1 January, 1900, in Gerona, Spain. His family moved to Cuba in 1905. There he studied violin and played in an orchestra in Havana. Between 1915 and 1918, Cugat played in New York as a member of The Gigolos. He later formed his own orchestra and played in the earliest sound films, continuing his film career into the 1980s. Xavier Cugat died on 27 October, 1990, in Barcelona, Spain. 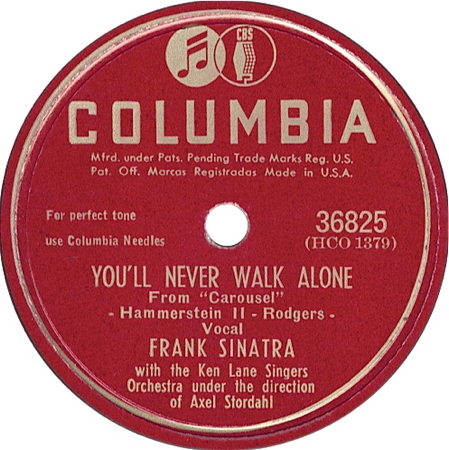 "You'll Never Walk Alone" was written for the musical, "Carousel." 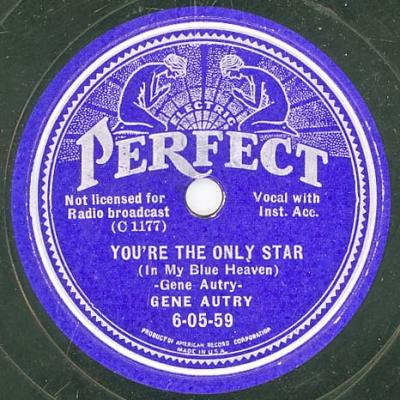 Although Frank Sinatra recorded his version on 1 May 1945, before that of the Carousel cast, John Raitt, Christine Johnson, Jan Clayton, and Chorus, whose own version was made at some time between 9 and 21 May. 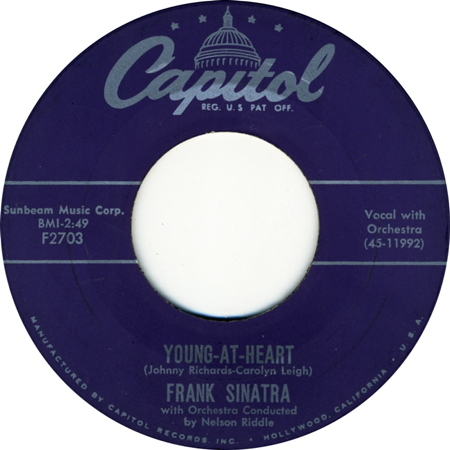 Sinatra's original recording was rleeased as a single on Columbia 36825, coupled with "If I Loved You." Gerry And The Pacemakers topped the UK charts for four weeks with the number in 1963. 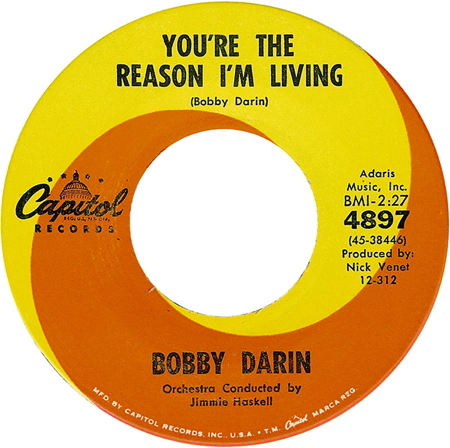 Darin recorded "You're The Reason I'm Living" on 25 September 1962. The number was released on 31 December 1962 on Capitol 4897. The CD on which Elvis's version originally appeared was sold with the book "Growing Up With The Memphis Flash" by Kate Wheeler. The song was later "officially" released. 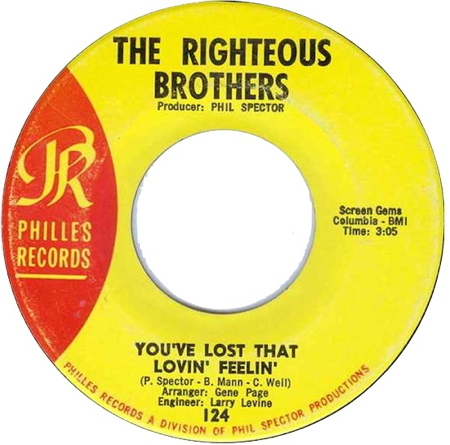 Johnny Richards' original instrumental, called "Moonbeam," was given lyrics by Carolyn Leigh, became "Young At Heat" and was recorded by Frank Sinatra in 1953 to become a hit single. The song was so popular that it was added to a film starring Sinatra and Doris Day, which was being made at the time, and the song title was used as the name of the film (which, up to that time, was unnamed). Elvis is captured singing just a line or two of the song during an informal recording jam at his home in Palm Springs in April 1974. Ric Cartey was born Whaley Thomas Cartey in Atlantic, Georgia, on 18 January, 1937. He composed the music for "Young Love" when he was nineteen years old; the lyricist, Carloe Joyner, was just seventeen. 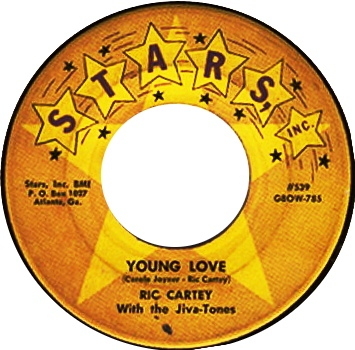 Cartey's original version of "Young Love" was recorded about October 1956 and released in November 1956 on the Stars label, number 539, as the B-side of "Oooh Eeee." 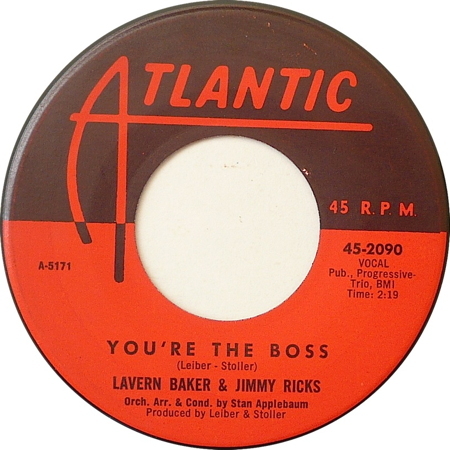 The same coupling was released again on RCA Victor 47-6751 some weeks later. Cartey's original was overshadowed by Sonny James' cover, which spent nine weeks at number one in the US Country charts in 1956-57. James started his career at the age of three (!) as a member of his family's band, The Lodens, well-known on the radio throughout the South of the USA. In total, James had 23 number 1's in those charts between 1956 and 1972. The number was also a big hit for Tab Hunter, both in the USA and the UK. Ric Cartey died on 5 August, 2009. 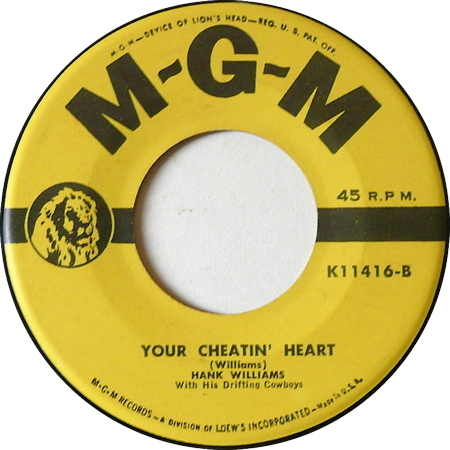 His original version of "Your Cheatin' Heart" was released shortly after his death, having been recorded on 23 September, 1952. Elvis was not pleased with his own recording of the number and it was not released for seven years.